Manager Tommy Wright is convinced Steven MacLean will solve St Johnstone's goalscoring problems if the striker can stay fit. MacLean scored his first hat-trick since a treble for Sheffield Wednesday 11 years ago as the Perth club hammered Hamilton Accies 4-1. 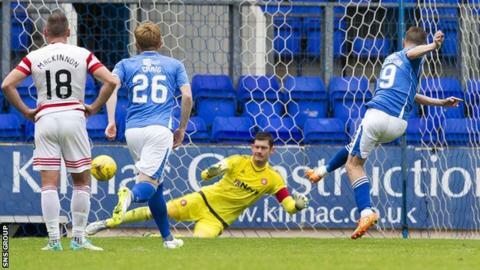 Liam Craig claimed the other St Johnstone goal, his first since returning to McDiarmid Park in the summer after two years with Hibs. However, it was the performance of MacLean that stole the headlines and meant he headed home with the match ball after scoring three times in the opening 54 minutes. That equalled his entire tally during an injury hit campaign last season and moved him on to six for this one already, which is just the form his manager was hoping for. After all St Johnstone only scored 34 goals in their 38 league matches last season and Wright is certain they will have now worries about a lack of firepower if MacLean avoids any more injuries. "It's great for Steven MacLean to get a hat-trick as we don't get many and it's real boost for the player," the Saints boss told BBC Scotland. "He's missed a lot of games through injury in the last couple of seasons but if we can keep him fit he will score a lot of goals for us. "He likes to drop in deep and link play but we do encourage him to get in the box a lot more. "Steven is a good finisher and he is a huge favourite with our supporters so if he keeps that up it makes it tough for the other strikers to get in. "That's what you want for the club and always feel that when he plays he leads the team well as he is almost like a second captain for you." Saints success in qualifying for European football last season was built on a strong defence but the Perth side are yet to keep a clean sheet this season. But the inclusion of Celtic's on-loan right back Darnell Fisher and Joe Shaughnessy's move to centre back promised much. "Joe Shaughnessy also played well. He is aggressive and quick to cover the ground so he slotted in well there so there is good competition for places." Hamilton Accies player-manager Martin Canning was frustrated that referee Andrew Dallas denied his side an early penalty when Norwich City's on loan striker Carlton Morris was clattered. But he was equally upset at the way his team conceded to quick goals midway through the opening period to leave themselves with a mountain to climb. He said: "I think even speaking to the St Johnstone players it was a stonewall penalty and probably a red card as well which would have changed the complexion of the game. "But that is football as some you get and some you don't and it doesn't excuse us going on to lose four goals. "Defensively we can definitely tighten up but if he gives it and we score than it would have been a different game. "We have started games well all season and I thought we did that again but the disappointing thing was losing the second goal so quickly after going behind. "It's how you react to losing a goal that matters and we should have done better as it's tough when the opposition go two up like that. "The performance in the second half was decent but we have to look forward to giving it our best shot at Aberdeen on Tuesday now even though it won't be easy."